A huge thank you must go to MamaOT who provided this epic list of ideas for sensory bags. Although sensory bags are typically for older children, I thought I would give one a go just to see how it would come out; I had a little spare time on my hands. I bought a few bits for this bag, all from Asda, and all cheap; The “foam set” was £4 (thought this would be handy to have in “stock”, the glitter and sequins were £1 each, the brillo pads were 15p each, the blue hair gel was 15p per tub (mega bargain! ), the beads were £2 per set (I actually discovered a huge bead set the following day in a charity shop for £1.50 – guess where I will now be trawling for sensory equipment!) and the funky duct tape I actually bought from ebay here for £3.99. I used a ziploc bag I already had but had one reservation, I have read that if you use a ziploc bag and then add anything sharp (sequins with sharp corners such as the star shape ones) they tend to break through the bag. I had some laminating pouches on standby to possibly iron around the edges and then use them but as it happened just kept everything inside the bag soft enough not to break it. I will try the laminating pouches idea at a later date when I start exploring more with sensory bags. The process was pretty simple. 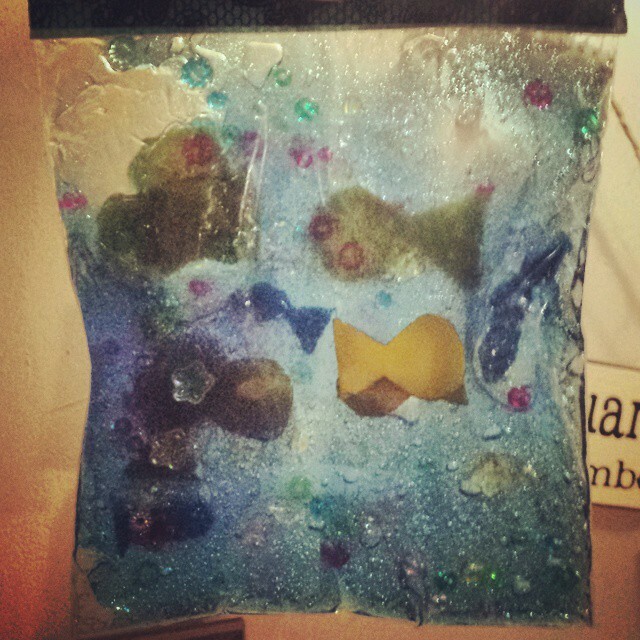 I emptied the jar of the hair gel into the bag, followed by the beads (removing the ones with sharp edges), followed by fish shapes that I had cut out of the brillo pads and the felt. Out of the two, I think the felt worked better over the brillo pads. I couldn’t see the blue brillo pad fish and the yellow brillo pad fish soaked up the blue gel so they didn’t stand out as much as the felt, which didn’t soak up anything. Then, when it was all in there, I squeezed the air out of it and sealed along the top with the duct tape, to prevent leakages. Note: I used a ziploc bag that was lying around, so on one side it had writing on it. I am to find some plain ones when I really start working with these! 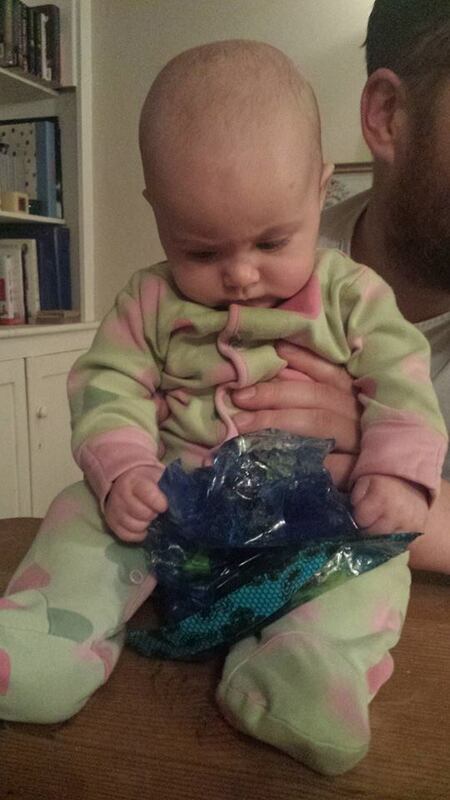 Evie did really enjoy playing with the bag, but I think it was more about feeling the texture of the gel and the beads inside the bag, and how cold it was, that interested her, rather than what was actually contained in the bag. 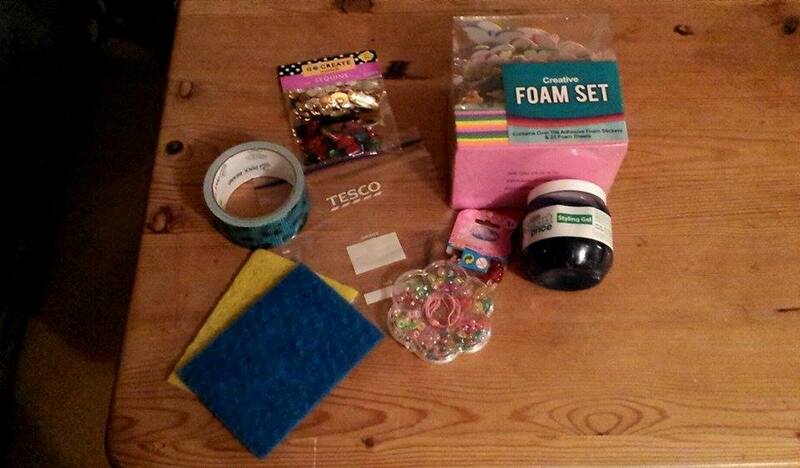 I plan to revisit sensory bags at a more age appropriate time so watch this space!